So you might notice a few major changes around here. As of now, this website is no longer Role-Play Craft, and is now 9th Key Press! Why the change? Mostly because I wanted to transition away from my intermittent amateur content and move into more professional independent and free-lance efforts. I’ve added dungeon maps to my repertoire fairly recently and these have given me the confidence to attempt to do something that I consider very important: to work for myself. 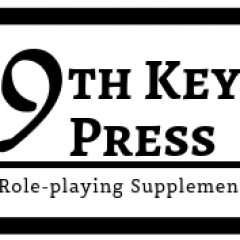 Me and my wife are launching 9th Key Press as an independent RPG content producer. Our first step is a Patreon (you can check it out here). This website will serve as a place to showcase our free content, especially the items we provide as early-access on Patreon to be later shown on here. As producers we hope to create a variety of products centered around RPGs. Supplements similar to what I use to do under the Role-Play Craft moniker, but also maps and art. Things like printable miniatures as well, and one or two page worksheets to help Dungeon Masters develop their campaigns. One of the things I want to put a lot of effort into is to create an archive of maps and illustrations provided for free under the Creative Commons license to help independent creators, especially new ones, to get their feet without having to spend a lot on commissioning maps and art for their early projects. I’ll be working out the details in a few weeks, so stay tuned. A lot of those free-for-use items will be provided first through patreon as early access content. So this is a map I did early on in my mapping efforts, during Inktober. It was the second day’s map, if I remember correctly, and for some reason I decided to do tiny tiny tiny brickwork. It took forever, it pained my hand, but I loved how it looked. It really helped to obfuscate my amateurish skills at that time. Here it is for your enjoyment and personal use! Our Patreon currently has several pieces of free content that haven’t yet made the transition over here, so even if you’re not interested in funding our patreon you should still hop over there to grab the free stuff and follow us for more. As for the content that used to be hosted on here, most of it has been archived away to either be cannibalized or re-written with more mindfulness and professionalism (and edited by my very talented wife). We’ve kept the Using Skills posts up because frankly they’ve proven to be the most popular posts I’ve ever done as Role-play Craft. I still think they need a lot of work, but you can find them under their own category in the menu. Until next time, thank you for checking us out and for those who have been here since the old days, thank you so much for continuing to check out my work through periods of silence. Greetings and welcome to a bit of a departure of the usual Role Play Craft fare. I tend to stick to optional rules mechanics or campaign and story content. However, my content production is around one or fewer posts a month these days – generally because what I do release is pretty comprehensive or wordy. Recently I’ve begun to try to organize myself using the Bullet Journal technique, and in doing so have challenged myself to practice certain daily, weekly, and monthly habits. One of those that pertains to this blog is to get one post published a week. What this means is I need to generate smaller bite sized bits of content to space out the time between the larger rules modules and story content. Thus this limited series of blog articles was born: Using Skills. What I hope to accomplish with this series of articles is to give both Players and Dungeon Masters a good idea of what a Skill is, it’s uses, as well as unique ways in which to use it. This latter effort is a bit of a continuation of the last post dealing with Skill Specialties. Hopefully this will make this series useful for beginner, intermediate, and veteran role players. I’ll be going in alphabetical order, and you can expect a new blog post about Skills each week on Tuesday until we reach “Survival” -whereupon I’ll need to find a new weekly subject. Interspersed with these, hopefully around once a month, will be the larger posts of rules mechanics and story inspiration that I tend to release as PDFs. The agile thief leaping from a rooftop into a small window below in the alleyway. An elven ranger falls from a slippery cliff, but rolls expertly to avoid hurting herself. A cocky duelist somersaults over two brutish bandits to come up behind them. Acrobatics is the domain of those wishing to perform stunts of agility and balance.